There are many things I adore about my college roommate Charlotte, but her unabashed love for chicken wings is high on the list. Charlotte loves wings like I love pie. When we eat out with her it is a givein that we’ll be getting wings, and she’s spent a lot of time recently trying to convince her fiance Gordon that wings are just the perfect food for a fall wedding reception. I have Char to thank for my love of wings, and for the fact that I’ve been trying to perfect my wings recipe in the hopes that her other bridesmaids will agree to a wings themed bridal shower. This week I whipped up a batch of honey chipotle wings using Tabasco Chipotle Hot Sauce and local honeycomb, a combination that was sweet and had a low, simmering spice. 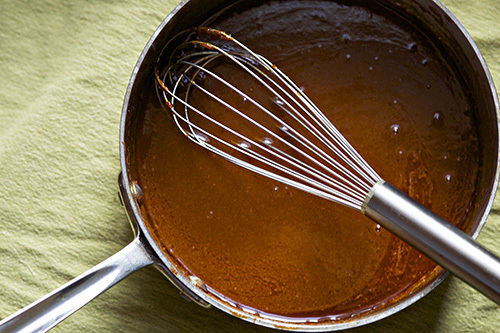 The solution for those times when you’re tired of the old hat buffalo sauce, your palate doesn’t feel up to the five alarm sauce that needs to be served with a gallon of milk, and you’re in the mood for something a little on the sweet side. 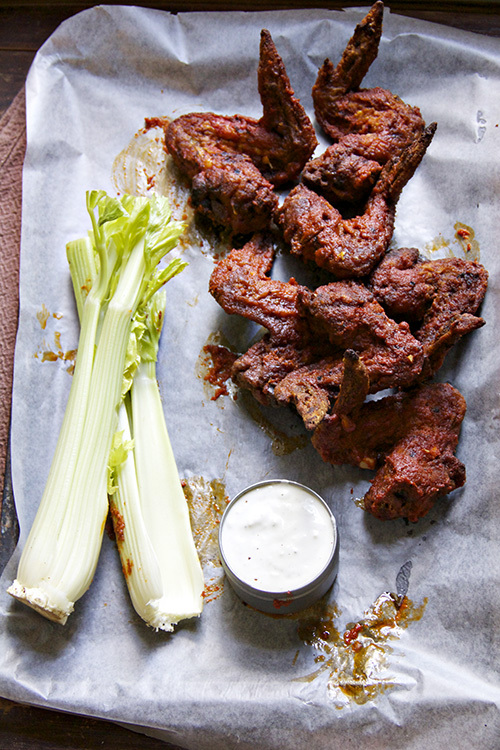 These wings will definitely be on the menu at Charlotte’s wingstravaganza. Later this month I’ll be heading to Avery Island, Louisiana, to visit the Tabasco headquarters, learn about the process of making their favorite hot sauces, and hopefully eat a lot of delicious food. As it were hot sauce makes up a significant portion of my diet, so I’m feeling pretty confident this may be one of my favorite trips this decade. 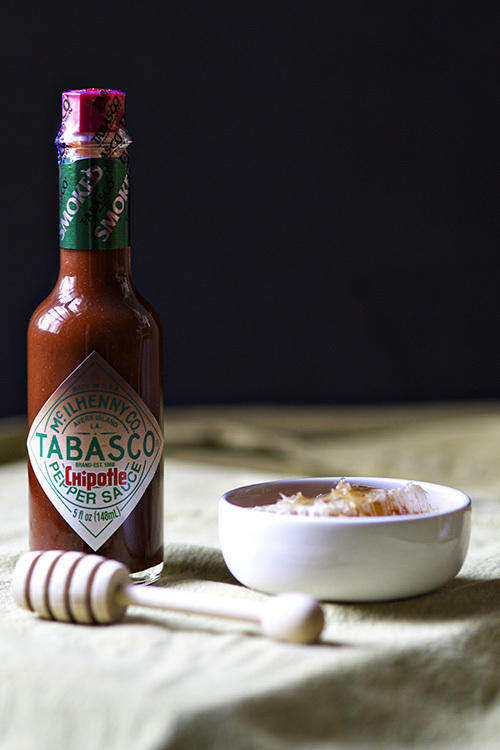 This post is sponsored by Tabasco. The words, thoughts, and opinions are my own. In a large and deep pot, heat enough oil to submerge wings. Oil temperature should be 375F. In a saucepan melt butter, honeycomb, and hot sauce. Simmer until completely incorporated. Mix together flour, panko, and spices in a medium size bowl. In another bowl whisk eggs. Pat wings down and dip first in eggs, then in flour mixture. Drop in oil and fry 4-6 minutes each or until golden brown. Immediately dunk them in the sauce, soaking both sides evenly. Transfer to a rack to cool slightly. Repeat with remaining wings. Mix together all ingredients for blue cheese dressing. 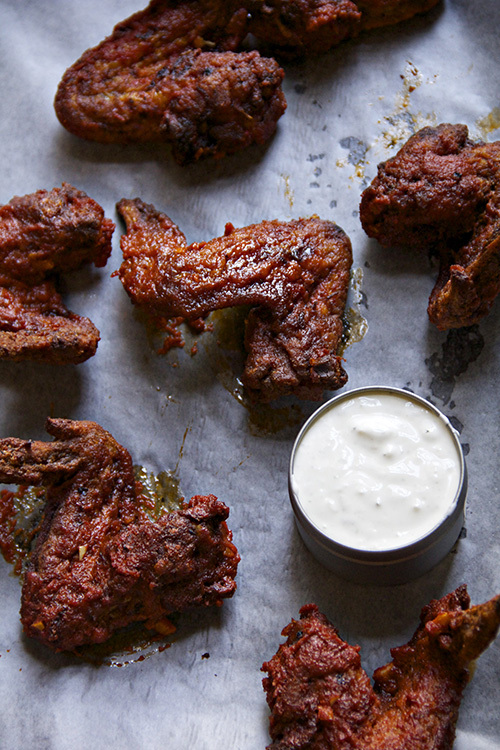 Serve wings hot with blue cheese dressing. Now we’re talkin’. Great photos. Great looking wings!